Last Sunday, while on our way to a Cricket match, me and Aagam (my batch mate at the cricket club) stopped by a roadside tiffin centre for a cup of tea. It was early morning and not much bustle around. Sipping that Irani tea I saw an old man - probably a beggar coming towards us. With a commanding voice, he ordered three glasses of tea and sat on the table next to us. Aagam went aghast!! !, "Bhaya what was that, I heard 3", uttered he. I told him that it was 3 indeed. Fiddling and checking his pockets frequently, he was looking for something. We were watching carefully, each moment of his. Then came another surprise. Somewhere from the suburbs of his clothes, he pulled out a cloth and placed it on the table. Opened it carefully as we were watching each and every move. Suddenly he gave us a look with his piercing eyes. Aagam was damn scared. 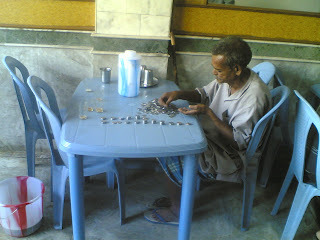 Finally the old man unfurled the cloth and took out lots and lots of coins. All kinds of coins, I mean all possible denominations available. 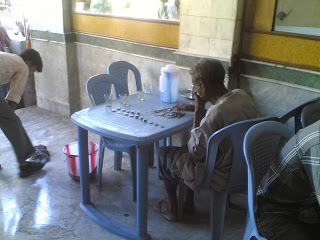 The beggar started sorting the coins and simultaneously sipping cups of tea. Started to make scrapers of coins. We were mere spectators. 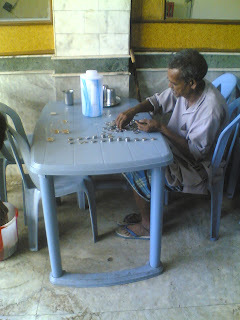 I took my camera phone and asked Agam to shoot a pic but he was damn scared with the look, the old man gave him. I took the initiative to click a pic and finally i managed to do so. It is worth watching. We decided to move on and join our team that has been waiting for us on the field. But it was quiet a good memorable moment that i wanted to pen down and share with you. This post is not the story of the bollywood bash …Dhoom 2, this is a post dedicated to the Autos of Hyderabad (yes the auto rickshaws). I have been to many cities of India including Delhi, Pune, Bangalore, Agra, Jaipur, Ahmedabad but autos from Hyderabad, what a wonder they are! I doubt about a place in India that has faster Autos than Hyderabad. They drive it so fast that if it is fitted with Jet Engine, it is capable of defying the gravity and shattering all speed records. Interestingly, the meter runs faster than their speed. Next time you come to Hyderabad, don’t forget to have an Auto ride. It will be a feast and I can bet on that! Ain't it fun!!! "Chindiyaa hai" (Superb)!!! Organizations are the subsets of society and cannot remain dumb. They necessarily need to communicate and actively interact with other clusters of the society in order to make their way upwards on the success graph. It is not an easy job as the clusters are heterogeneous and the nature of interaction with the people outside the organization is diverse. So, to manage this tricky task, a professional approach known as Public Relation is employed by the organization. Public Relation involves supervision and assessment of public attitudes in addition of maintaining mutual relations and understanding between an organization and its public. An organization needs to interact at constant rate. As the channels of communication have multiplied drastically, its main function is to improve those channels and making out new ways of setting up a full duplex, two-way flow of information and understanding. Recent decade has witnessed a massive growth in High Tech Sector. A large number of Tech firms, all around the globe, over the time have adopted and occupied this field. Hundreds are still budding out in developed, developing as well as under-developed parts of world. High tech industry has turned out and evolved into a huge marketplace. An enormous number of reasons count for growth of such organizations. Large scale Automation, expanded businesses, innovations, advancements in science and technology can be a few major drivers. The Tech industry is dynamic, fast moving and has constant new product or upgrades and above all fierce competition between brands. In addition to that, disruptive technologies are impacting the world in which we live. Today, all kind of technologies rely on public awareness and support. High tech companies are not only required to prove their technologies to customers, but media and analysts as well. If they misunderstand the value of technologies, these business entities will struggle for support. It can have a drastic impact on the existence of an organization. Jobs will be eliminated, budgets cut, and support will be directed elsewhere. Public relation prevents and eliminates the risk of getting entangled in such situation. A good Public Relation program practice can help out the Tech firms to have clear messages and distinctly articulate their vision. It can help the organization in becoming industry leaders by advancing their technologies. It can help out the organization in making the statistics and numbers more understandable and meaningful so the audience comprehend the message and supports the initiatives. Technology is all about innovations. But it is complex too. The people who are the ultimate users of these innovations cannot easily understand what an innovation means for them. It is the job of public relations department of that organization to make the end users really understand what benefits are in a particular innovation. And this can be done by them through events, shows, trade fairs and may be through publications like trade journals, etc. PR can play a very vital role for the Tech Industry in branding. It is known for dominating the art of branding in the technology industry. It is considered the most effective at building brands as it delivers credibility. It can be a “lifeline” to the early-stage high tech companies. Instead of investing in advertisement and other forms of marketing, these companies can put all of their money meant for marketing, in Public Relations. With limited resources, PR delivers the most value for the buck while also delivering the highest level of credibility and understanding. PR is effective at building and sustaining buzz. A well designed PR program for a High Tech firm gives it a competitive advantage. It can build an image and generate visibility. A good healthy media relation with the relevant key media person, securing story opportunities and responding well to media inquiries as interest in your company builds momentum. It can place the unit under the spotlight, making it stand out in a crowded market. Other PR programs can take the form of industry relations with trade associations, marketing communications, trade shows/special events, analyst relations, and awareness campaigns designed through award recognition and speaking opportunities. Another interesting thing prevalent in the Tech industry is the concept of “Technology Partnering”. A company produces a specialized component, partners with other system providers which in turn comes out with an integrated offering to the market. One can hardly point out a single Tech company without having technology partners. PR performs the role of regularly coordinating and communicating with these partners. To come out with a single offer to the market, coordination is a vital element for success. Managing PR for such a sector has been and shall remain a challenge. Since the growth has been limitless horizontally as well as vertically, the publics associated have grown to an extent which is beyond imagination. Though PR lends a helping hand to the tech companies and helps them to meet their objectives, they have some inherent flaws that need to be corrected. Most PR personal are not too tech savvy and get lost while explaining technology to their audience. They are not knowledgeable enough about the tech field hence communicate a message that is misconveyed. They use the same methods to market or communicate a tech product as they market other conventional product which is a big problem. Another thing that is quiet noticed is that PR takes time and does not necessarily work on the schedule. Planting new ideas or changing minds is a slow process. But when a PR program rolls out over a longer period of time, prospects have time to adjust their attitudes. Brands that take this approach are longer lasting, too. Lessons from the past reveal that the Tech industry has been built on successful Public Relations. There are examples of plenty of mega players in the present High Tech world. Among them renowned companies like Amazon, Yahoo, eBay, Google, Microsoft, Intel, BlackBerry are some of those companies that built their initial identities via PR. Other tech giants like SAP, Cisco and Oracle also built positions via public relations before spending big bucks on ad campaigns. There are countless others. Nowadays, Public relations employs diverse techniques such as opinion polling and focus groups to evaluate public opinion, combined with a variety of high-tech techniques for distributing information on behalf of their clients, including the internet, satellite feeds, broadcast messages, and blogs. With the advent of Internet Technologies and the need to get online on the web a new form of PR known as Interactive Online PR has come into existence. It includes blog monitoring, Web conferences, online press rooms, news and online monitoring, social networking strategies etc. But the Internet is yet to become a mass medium, it is all about niches. Hence it may take some time to evolve but it has a great future there. Recent trends to organize regular in-house meeting between the board and employees are catching up, so as both the parties can interact and put forth their ideas and complaints, if any, so as to streamline the operation as well as ensure the growth. Coming-up with regular in-house journals also gives the employees a feeling that they are being heard in the organization and that they are taken seriously. This gives them a feeling of relationship with the organization. The future of public relations is going to be more complex and no organization can really afford to remain in the business without a proper and optimum public relations wing. The department will be doing most of the marketing for the organization and this would force organizations to have a team of professionals from varied backgrounds in their public relations departments. The team would be comprising of not only communications experts but marketing guys, sales engineers and may be organizational behaviorists who can really interact with publics from across nations with different cultures, languages and what not. In view of PR companies, the Tech industry is considered as a goldmine. It has definitely got something in it for these organizations.